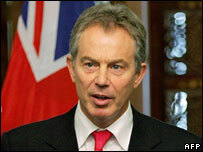 People entering the UK must be prepared to be tolerant or not become part of society, Tony Blair has said. In a speech at Downing Street, the prime minister said that tolerance was "what makes Britain" and warned "we must be ready to defend this attitude". The threat came not from "generalised extremism" but "a new and virulent form of ideology associated with a minority of our Muslim community". The Muslim Association of Britain said Mr Blair's speech was "alarming". A spokesman said the prime minister should be "investing in our society" to help the deprived, rather than investing "millions and billions in illegal occupations" which had "not helped to promote multiculturalism in this country". "Rather than standing up and lecturing us, it's time he puts his money where his mouth is," the spokesman said. Mr Blair also used the speech to reiterate a crackdown on funding for religious and racial groups, saying in the future they would have to prove they aimed to promote community integration. This measure was recently announced by Communities Secretary Ruth Kelly. Conservative community cohesion spokesman Dominic Grieve said the speech was a "remarkable turnaround". "Many of the problems in relation to the issues he addresses are at least in part the consequence of a philosophy of divisive multiculturalism and political correctness that has been actively promoted by the Labour Party over many years at both national and local government levels." Liberal Democrat communities spokesman Andrew Stunell said: "We must ensure that the voices of moderation have their say, but support for organisations must not be distorted by government-driven targets or Tony Blair's personal agenda." Multiculturalism makes our country more diverse, but does it actually make it any better? He said: "The right to be in a multicultural society was always implicitly balanced by a duty to integrate, to be part of Britain, to be British and Asian, British and black, British and white." Mr Blair said "multicultural Britain" should not be dispensed with, adding: "On the contrary, we should continue celebrating it,"
But he said the suicide bombings in London on 7 July last year had thrown the whole concept of a multiculturalism "into sharp relief", the prime minister said. "The reason we are having this debate is not generalised extremism. It is a new and virulent form of ideology associated with a minority of our Muslim community. "It is not a problem with Britons of Hindu, Afro-Caribbean, Chinese or Polish origin. Nor is it a problem with the majoirty of the Muslim community." But he said there was a "problem with a minority of that community, particularly originating from certain countries". The failure of that part of the community to integrate did not mean multiculturalism was dead, said Mr Blair, but it would be useful to define "common values" all citizens were "expected to conform to". Mr Blair also said: "If you come here lawfully, we welcome you. If you are permitted to stay here permanently, you become an equal member of our community and become one of us. "The right to be different, the duty to integrate: that is what being British means. "And neither racists nor extremists should be allowed to destroy it." Mr Blair said the Equal Opportunities Commission would be looking at concerns about women's status inside Muslim communities. It will report in the spring. He also praised Tory leader David Cameron, saying it was "not conceivable in my view" that he would seek to exploit immigration to win votes. Labour MP Keith Vaz MP has criticised the newly formed Commission for Equality and Human Rights for taking just one of its nine commissioners from a background in working for race equality. Only chairman Trevor Phillips had this experience, he added. How diverse is multicultural Britain?